Officer Brinna Caruso has built a reputation at the precinct as the cop to call when a child goes missing. For Brinna, it's personal because she was once one of them. Brinna and her K-9 search and rescue dog, Hero, will stop at nothing to find a missing child, no matter the stakes. Detective Jack O'Reilly isn't ready to return to his homicide duties after losing his wife to a drunk driver. He's on the downside of his career, and bent on revenge, when he's assigned as Brinna's partner. While on patrol, Jack struggles between his quest for personal justice and his responsibility to those around him, especially his partner. Skeptical of Jack's motives, Brinna isn't sure she can rely on her new partner, whose reckless abandon endangers the safety of those around him. But when a man surfaces with an MO similar to the criminal who abducted Brinna twenty years earlier, Brinna and Jack must cast aside previous judgments and combine efforts to catch the kidnapper, and finally allow Brinna the peace stolen from her as a child. 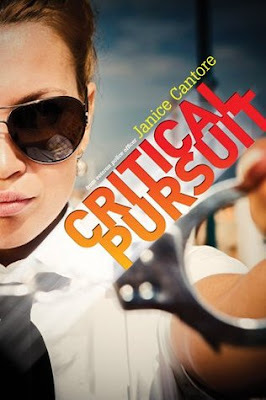 I spotted Critical Pursuit on NetGalley and was intrigued by the premise. Some quick perusing on Goodreads revealed that a number of people compared this author to Dee Henderson (who writes some of my favorite Christian fiction). Henderson's books are typically thrillers that leave you on the edge of your seat - anticipating the outcome but still enjoying the time it takes to get there. Officer Brinna Caruso was abducted as a child, and now she's dedicated her life to finding missing children. It's her passion and her mission - and her only focus is on bringing those kids home. Then, something happens that forces her to step aside from her normal duties. During this time, she's also having to deal with a new partner, Detective Jack O'Reilly, since he's not ready to return to his homicide duties after the death of his wife in a drunk driving accident. He's reckless, angry and bent on revenge. His only focus is on making someone pay. Then, his time with Brinna starts making him question everything. Overall, I liked this story. The plot moved quickly and kept my interest, and I liked the setup of a cop whose history has had such an impact on her present. It was not, however, an edge of your seat read. I think it was close, but it missed the mark a little bit in terms of intensity and pacing. I never felt like things wouldn't work out or was afraid or nervous about the ending. For me, that's a requirement for something to be a really strong thriller. I also thought a few aspects were wrapped up a little too quickly or lacked the needed punch, which ties into my larger issues with the pacing. Certain aspects of the story felt more realistic than others. My brother-in-law is a police officer, and the environment of the police department in this book didn't really match what my brother-in-law has said about his workplace. I know the author was a police officer for 22 years, so I'm certainly not questioning her credibility. However, for me, the fact that this was Christian fiction made the conversations between some of the officers feel a little less authentic. There was a somewhat rosier or less gritty tone to their workplace than I'd expect. Also, spiritual issues and questions do dominate a good portion of the book. While I liked the book, I think it was missing a few things that would have made it a stronger read. It is the first in a series, so there are a number of things that are left open and will likely be resolved in future books. I didn't love this book like I'd hoped, but I'm still curious enough to read the next book in the series. I wonder what Officer Caruso will be up to next! "Sometimes the people we love the most are the hardest to talk to." *I received a copy of this book from Tyndale House in exchange for an honest review. I was not compensated in any way for this review.